VATICAN CITY – A cartoon in the January edition of an Italian Jewish newspaper showed Pope Benedict XVI crossing the Tiber River on a tightrope, trying to balance himself using a pole labeled “dialogue” on one end and “conversion” on the other. As he prepared to cross the river and travel from the Vatican to Rome’s main synagogue Jan. 17 no one pretended the journey was going to be easy. There is continuing unease in the global Jewish community over Pope Benedict’s decisions to advance the possible beatification of Pope Pius XII, to lift the excommunication of a Holocaust-minimizing traditionalist bishop and to issue a revised prayer for the Jews in the Tridentine-rite Good Friday liturgy. The sensitivity to these actions is heightened in Rome. Jews lived in Rome before Christ was born, and centuries of interaction between the city’s Jewish community and the popes means Jewish-Vatican relations in the city have a unique history, much of it sad. The staff of the Jewish Museum of Rome, located in the synagogue complex, is planning a special exhibit that will illustrate part of that history for Pope Benedict and for other visitors in the coming months. The centerpiece of the exhibit is comprised of 14 decorative panels made by Jewish artists to mark the inauguration of the pontificates of Popes Clement XII, Clement XIII, Clement XIV and Pius VI in the 1700s. For hundreds of years, the Jewish community was obliged to participate in the ceremonies surrounding the enthronement of new popes – often in a humiliating manner. Various groups in the city were assigned to decorate different sections of the pope’s route between the Vatican and the Basilica of St. John Lateran. The Jewish community was responsible for the stretch of road between the Colosseum and the Arch of Titus, which celebrates the Roman Empire’s victory over the Jews of Jerusalem in the first century. The Roman victory included the destruction of the Temple, Judaism’s holiest site, and the triumphal arch depicts Roman soldiers carrying off the menorah and other Jewish liturgical items. Rome’s main synagogue is located less than two miles from the Vatican in the neighborhood that was once the city’s Jewish “ghetto,” a word originally coined by the Italians and used to describe a section of a city where Jews were forced to live. He said that it was “completely absurd and improper” that the Jews should prosper in a Christian land when they were “condemned by God to eternal servitude” because of their lack of belief in Jesus. 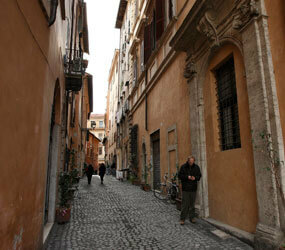 Rome’s Jews were forced to live in the ghetto until the fall of the Papal States in 1870. The population inside the four square blocks of the ghetto fluctuated between 1,750 and 5,000 people. The pope’s visit to the synagogue was scheduled to coincide with the Italian Catholic Church’s celebration each Jan. 17 of a day for Catholic-Jewish dialogue. This year, the date also coincides with Shevat 2 on the Jewish calendar, which is the day Rome’s Jewish community commemorates a miracle in the old ghetto. Convinced that members of the Jewish community were working to import the ideals and freedoms espoused by the French Revolution – including separation of church and state – a mob set fire in 1793 to one of the gates of the ghetto, apparently planning to burn all the houses down as well. But the skies suddenly grew dark and a heavy downpour put out the flames and sent the mob home. Most of the buildings were torn down after the ghetto gates were opened in 1870; a new major synagogue – the one the pope will visit – was constructed in the area between 1901 and 1904. Just a few yards away from the synagogue stands a church whose history is closely tied with that of the ghetto. A plaque above the entrance bears a quote – in Latin and in Hebrew – from Isaiah: “I have stretched out my hands all the day to a rebellious people, who walk in evil paths and follow their own thoughts.” The Church of St. Gregory faced the entrance to the ghetto and the plaque reflected an attitude held by Catholics for centuries that despite all that God had done for them, the Jews rejected the savior. Between 1572 and 1848, churches next to the ghetto also were used for the “forced sermons” aimed at convincing the Jews to convert to Christianity. Each Saturday evening, a specified portion of the Jewish community was obliged by papal edict to listen to a priest preach about Christ using the same Scripture readings the congregation had heard that morning in the synagogue. Legend has it that many of the Jews plugged their ears with wax during the sermons. While Catholic-Jewish relations have improved enormously over the past century – especially because of the teaching of the Second Vatican Council and the outreach of Pope John Paul II – the cartoon of the tightrope-walking pope in the Pagine Ebraiche newspaper made it clear the unique history of Rome’s Jewish community and the popes has not been forgotten.